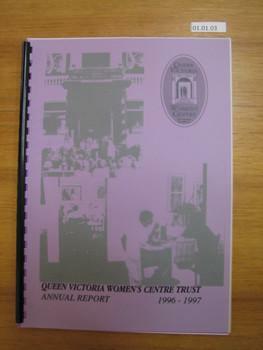 The QVWC Archives is a current venture focusing on organising the collection to ensure preservation of the history, and business activities of the Centre and Trust, whilst allowing for acknowledgement the people and organisations who have worked within the building. 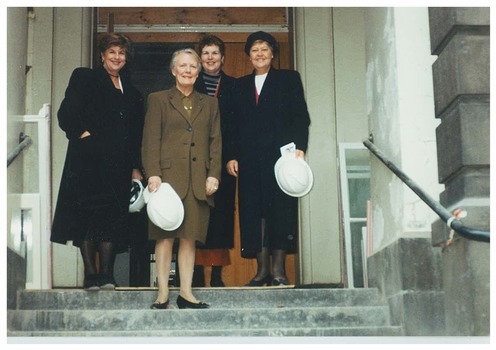 The collection comprises of items after 1989, when Monash Health took over the hospital and the people of Victoria fought to keep the iconic building and legacy "for women, by women" thriving. This is a project, run thanks to the successful grant application to Helen McPherson Smith Trust. 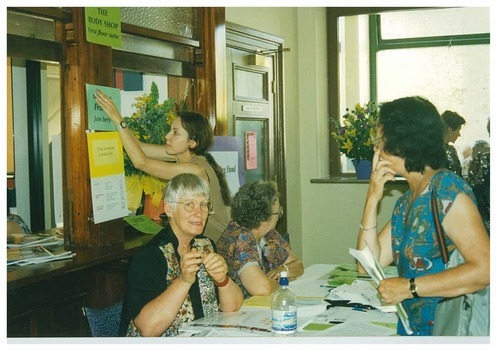 The archival project is supported by the QVWC Trust, and there is great interest in the wider community already. 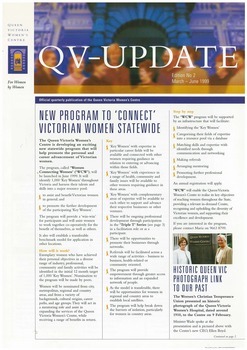 The QVWC wants to continue to acknowledge its history but more importantly to use this history to grow operations. 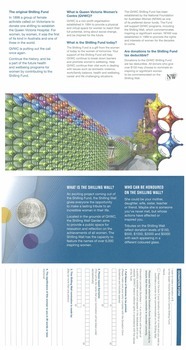 This collection has already been acknowledged by PROV in 2014 Multimedia History Award for the Centenary Digital Timeline Website project and the National Library of Australia as they have archived the QVWC website. This project will confirm both the social and cultural significance of the building and the organisations who have occupied the building by collaborating with Victorian Collections. QVWC has a take down policy, if you believe we may have breached copyright please contact the centre. Pandora entry QVWC - Archived QVWC websites. Colour photo. Taken in first floor gallery space. 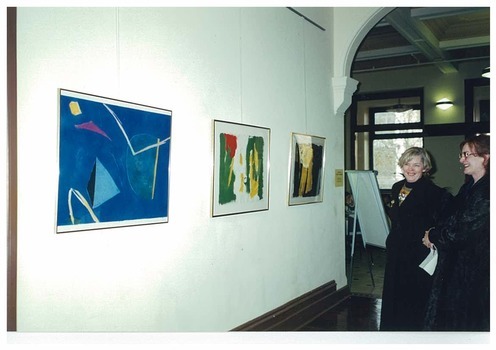 Example of the first art exhibition the QVWC hosted. 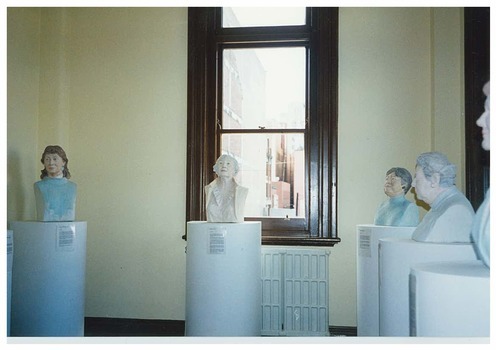 Busts of influential women 'Return of the goddess' by Ruth Lyon. Colour photograph. Unofficial launch of shilling fund. Patrons cutting the cake. 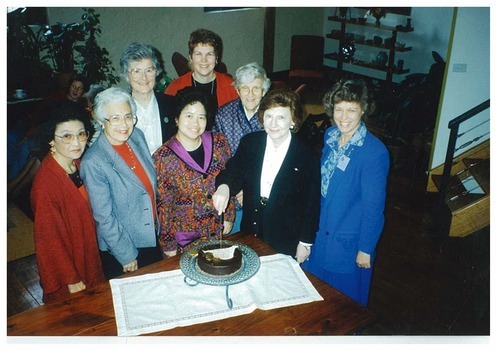 Eight Women stand behind a table with a cake on a swerving platter. At host's, Chair Janet England's house. Front row left to right: Maron Lau (Trustee), Fleur Spitzer (Patron), Prof. Trong Thomas (Patron), Noel Waite (Patron), Glenys Sharma (General Manager). Back row left to right: Jean Tom (Patron Country Women's Association), Janet England, Prof. Nancy Mils (Patron). Colour photograph. Gallery space on ground floor corridor. Art is coloured abstract paintings from an unidentified artist. Two women appear right of frame. 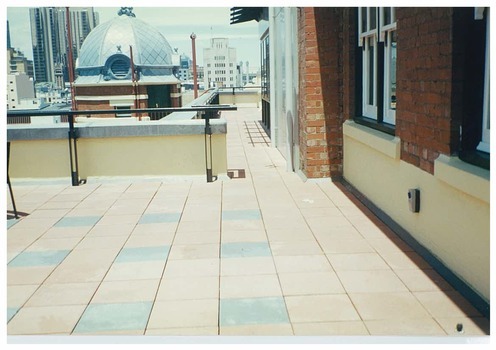 Taken from the corridor towards the south of the QVWC building towards the entrance and Lonsdale street. A4 cardboard coloured images poster. Newspaper article on page C11. purple A4 page with black ink. Folded twice to create a pamphlet. Describing centre services and organisation background information. Made before opening of the centre. Colour photograph. Ground floor entrance foyer facing north west. 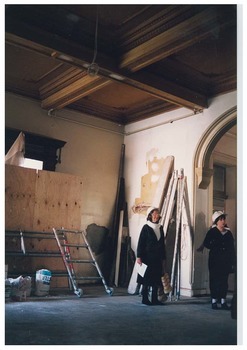 Taken during Restoration inspection. Two unidentified women are standing facing east wearing hardhats. 20 stickers to each page. Purple logo on cream. 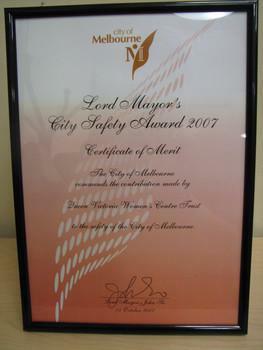 Framed certificate. Orange background. Black text. Black and white photograph. Ground floor acing south towards Lonsdale street in what was the cafe and in 2015 is the Breacan office. Wires hang from roof. Wheelbarrow in middle of frame. 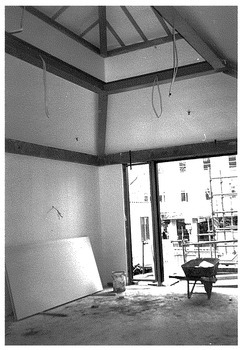 Taken during restoration inspection. Colour photograph. 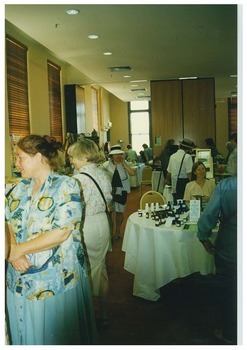 Mini expo in level four Victoria room of the QVWC during the official opening weekend. People walking between tables and chairs, all unidentified. Print post approved envelope. 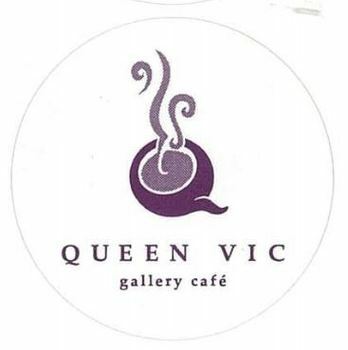 White in colour with black QVWC old logo on left corner. Inside which is a flyer requesting support for the shilling fund 1996. It is glossy white paper with black ink. 22 A4 pages. Front page is translucent. Back of document is black cardboard. page two purple colour paper. Pages 3-21 white with black ink. Black plastic binder. 59 pages. Red cover with silver text. Internal, white paper with black ink, black and white images throughout. 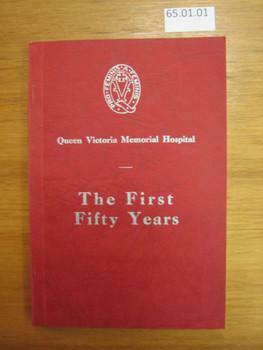 The Queen Victoria Memorial Hospital crest on the front cover. 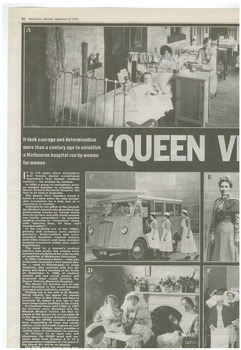 Double page pages 32 and 89 of the Herald Sun Black and white photos throughout. 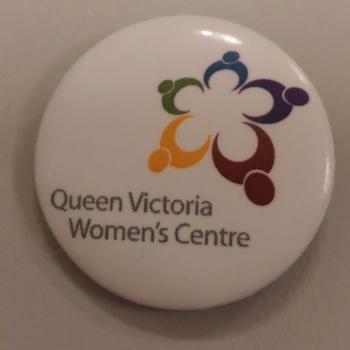 Invitation - It's the 10th ANNIVERSARY of the Queen Victoria Women's Centre Trust! Thin carboard double sided document. Orange, purple and white colour scheme. 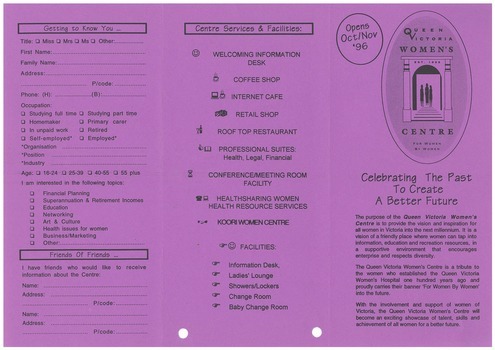 On the front right side of item is a purple 'grey scape' of the QVWC building. on the back Provides details of the event. 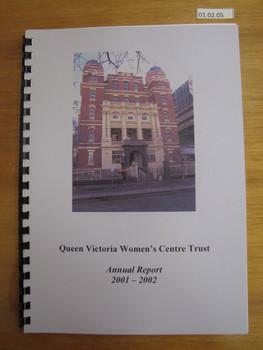 For an event held for the 10th anniversary of the QVWC Trust. Colour photograph. 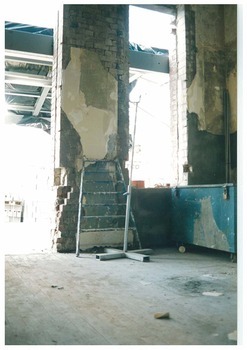 Level one south eastern corridor looking into where in 2015 is a doorway at the wall and where is the archive room. 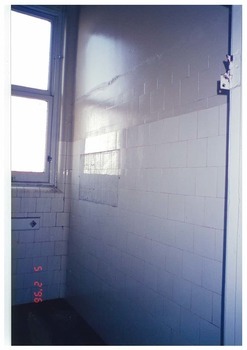 Taken during restoration inspection. 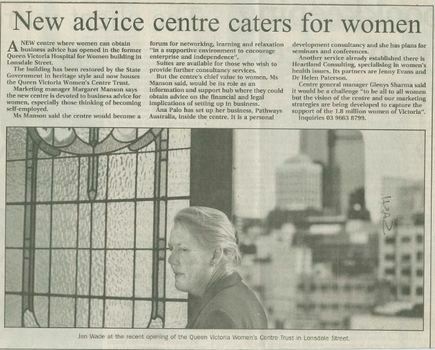 newspaper clipping from The Age. Graphic representing the works to be done on the QV block between Swanston street and Russell street. 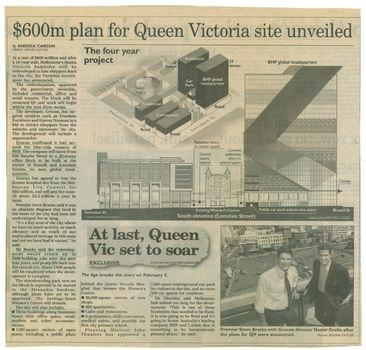 Black and white photo at the bottom of page of Premier Steve Bracks with director of Grocon, Daniel Grollo after the plans for QV were announced. 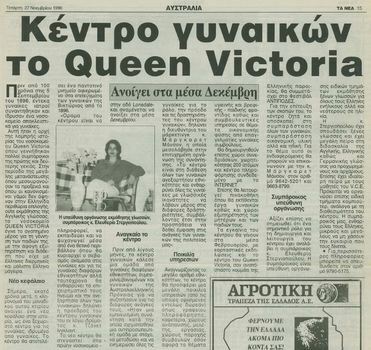 Greek community newspaper. Black and white photograph of a woman sitting with a flower vase. Folded A3 printer paper to make 4 pages of A4 content. Purple, red and gold accents. Mostly black text. Coloured photos throughout. Announcing new program 'Women Connecting Women' and 'Triple T' Series. 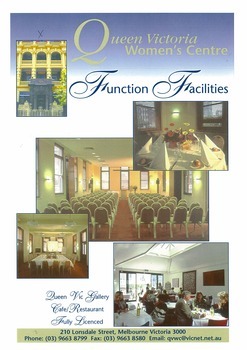 Notice the Queen Vic Women's Centre Inc. has closed. Colour photograph. 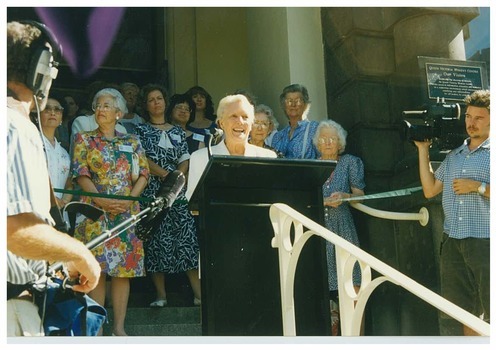 Jan Wade, Minister for Women's Affairs, standing behind a lectern on front steps of the QVWC building at the grand opening weekend. Several people stand around including Marion Lau, Trust member and camera/sound crew. Colour photograph. Ground floor looking east formerly the administration offices into what was to be the cafe and in 2015 is the Breacan office. Ladder leaning against brick wall. Blue locked trunk left of frame, Taken during restoration inspection. 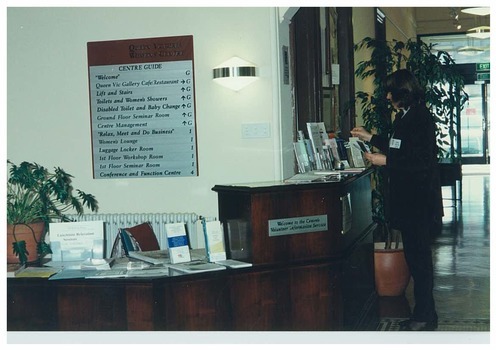 Colour photograph believed to be an information desk. Taken on ground floor foyer during the official opening weekend. Possibly shilling fund donation point. Five people in frame all unidentified. A4 page. Folded twice to create a pamphlet. Donation/nomination form for the shilling wall. 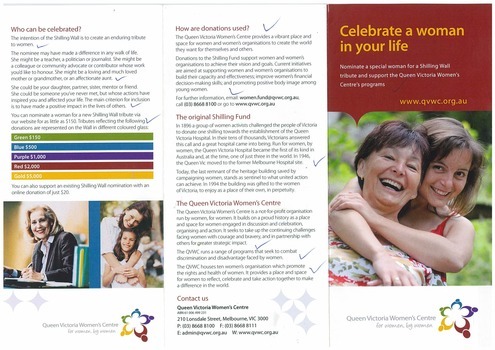 A project to create an enduring tribute to Victorian women at the QVWC. Colour images on both side of the page.